Every immigrant that comes to Canada has a story. This book captures ten of those stories and the remarkable resiliency and fortitude of the human spirit. In 1994 one of the worst genocides in human history took place in Rwanda—over one million people were killed in 100 days. 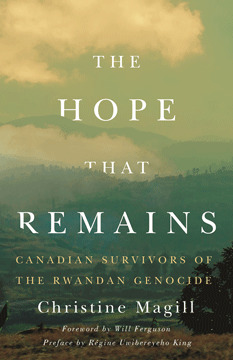 Each chapter in The Hope that Remains focuses on a Rwandan survivor and their journey to escape the violence and chaos that overtook their country. Two of the featured stories follow individuals who fled before the killing began and the events that caused them to flee. Both were then faced with the challenge of being outsiders looking in as events deteriorated and their families were slaughtered. The other eight survivors share their detailed and gripping experiences of trying to stay alive while trapped in a nation of killers. Twenty-five years after the Rwandan Genocide the scars are still very real and rebuilding and coping with the trauma remains an emotional struggle. Despite their horrific pasts the survivors share feelings of hope, forgiveness, and a belief in a better future. They demonstrate the strength and courage it takes to leave the known behind to seek a better life in a new country. Their journeys to Canada contain humorous moments, thoughtful insights, and an overwhelming love and pride for the nation they now call home. Christine Magill is an educator specializing in genocide studies. She has travelled to Rwanda five times over the last nine years. In 2015 Christine Magill received the Canadian Living Me to We Educator Award in recognition of her engagement and involvement in genocide education. She lives and teaches in Strathmore, Alberta. Will Ferguson is an award-winning travel writer and novelist. His novel 419 won the Scotiabank Giller Prize and his travel memoir, Road Trip Rwanda: A Journey Into the New Heart of Africa was nominated for the 2016 Charles Taylor Prize. The Shoe on the Roof is his most recent novel.He lives in Calgary, Alberta. Régine Uwibereyeho King is an Associate Professor in the Faculty of Social Work, University of Calgary and an Adjunct Professor in the Faculty of Social Work, University of Manitoba. 212 pp 8.5" x 5.5"